Happy Monday! We have some exciting news: we have now officially made it through all five stages of our framework! If you’ve been following us since the beginning, then you’ve read them all. If you joined us part-way through the journey, you can get a quick recap from this post. For this series, every Monday we’ll tackle a newsworthy issue in education and discuss it in the context of our framework. We’ll comb the educational news, journals, research, and blogs to find out what everyone is talking about and share it with you. To kick off this inaugural post, we decided to talk about an issue you can’t avoid right now in education news: teacher evaluation. In fact just last week, New York City unveiled its teacher evaluation system. This news has unleashed a flutter of commentary about whether the system will positively impact the learning of New York City’s students. Will this model for teacher evaluation accurately predict student achievement? To do this researchers have played with percentages, engaged in randomized trials, and poured over data sets from around the country. Some of the best recommendations come out of the Gates-funded Measuring Teacher Effectiveness Project. 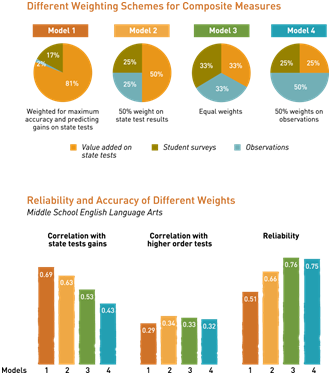 MET’s Culminating Findings were published in January and suggest that evaluations should include a composite of student scores on standardized test, student surveys, and observations. The study discusses different ways to weigh those factors to best correlate evaluations with student achievement. 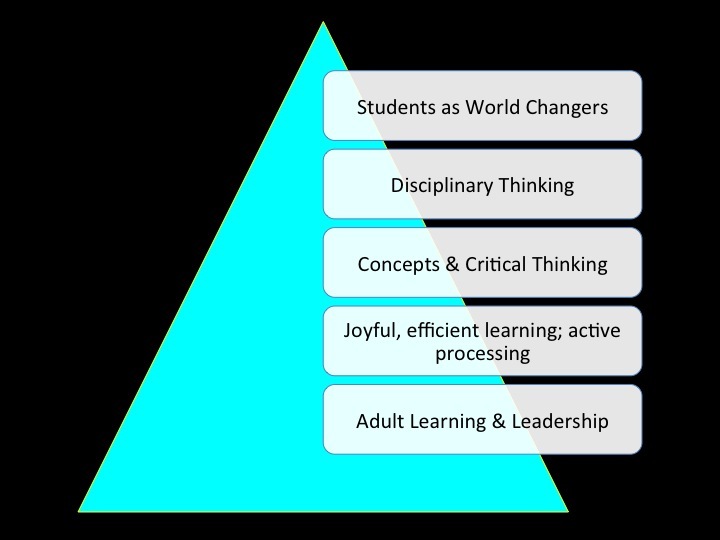 1) How do we define student achievement? 2) Does this evaluation system itself lead to improved student achievement? The MET authors delve into the first question by using both state tests and “more cognitively challenging”/ “higher order” tests to measure student achievement. Interestingly of the four models for weighing different elements in teacher evaluation, the highest correlation to the higher order test was only 34% . The model that had the highest correlation to state test achievement had the lowest correlation to the higher order test achievement (69% for the standardized test and 29% for higher order). Clearly there are no easy answers here. In Stage 1 of our framework, we assert that improving student learning requires adults to commit to continuous improvement, question assumptions, take risks, and reflect on their actions and choices. In order to help students grow, adults need to be growing as well in their professional practice. Teaching is complex and requires that we consistently push ourselves to try new well thought-out approaches and reflect on their effects in the classroom. 1) Does the system encourage teachers to stretch and take risks? 2) Does it help teachers grow in and reflect on their practice? Having a framework for thinking about learning helps us pull these questions out into the light. So when we are considering teacher evaluations, student survey are both gosh darn on point and helpful in providing feedback that will lead to teacher growth. Thinking about evaluations in the context of Stage 1 of our framework, that matters. The take home message is this: we need evaluations that don’t just tell us which teachers are strong and which teachers are weak. We need evaluations that will help teachers grow because ultimately that translates into better learning for students. Therefore when it comes to conversations about New York City or another evaluation system, let’s not just get stuck on whether or not it is an accurate predictor of what students will do at the end of the year, but rather if it helping to build the capacity in teachers that leads to the best learning possible. Next postHave you mastered stage 1?